The current Oklahoma state flag is a reflection of the state's traditional mixture of Native American and colonial heritage. 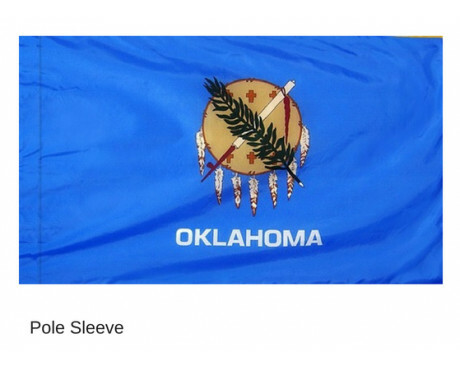 The Oklahoma flag is also one of the youngest state flags in the United States, but it does follow in the footsteps of several older designs. 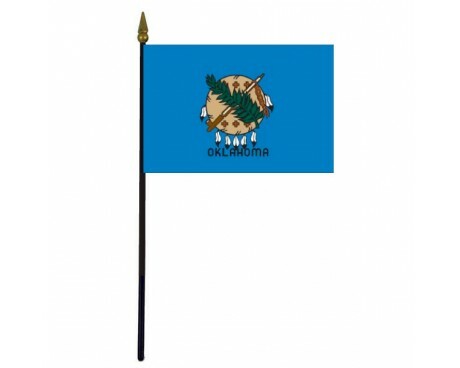 The state flag of Oklahoma consists of a sky blue field with a Buffalo-skin shield and seven eagle feathers in the center. A ceremonial pipe and an olive branch are crossed over the center of the shield, and the state's name is written below it. The shield is a symbol of the state's Native American heritage. The ceremonial pipe and the olive branch that are crossed over the shield are symbols of peace, and their use together represents peace between the native people of Oklahoma and its early colonists. The blue field of the Oklahoma flag represents devotion. 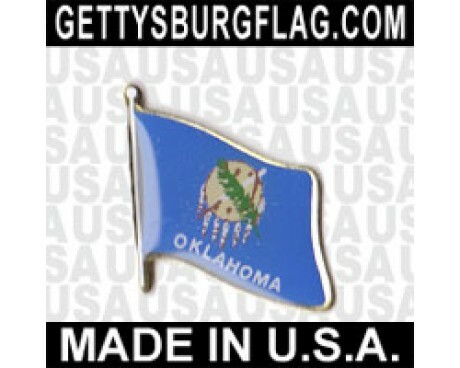 The first state flag of Oklahoma came into use in 1911, which was only four years after it was admitted into the United States. It had a solid red field with a white star and the number 46 in the center, which honored Oklahoma's place as the 46th state to join the nation. The process to replace the original Oklahoma state flag began in 1924. It was motivated by a desire to get rid of the red field, which had become associated with communist nations. The Daughters of the American Revolution organized a contest to develop a new design, which was eventually won by Louise Fluke. Fluke's design came into use in 1925. It was fundamentally similar to the current flag, but it did not include the state's name. 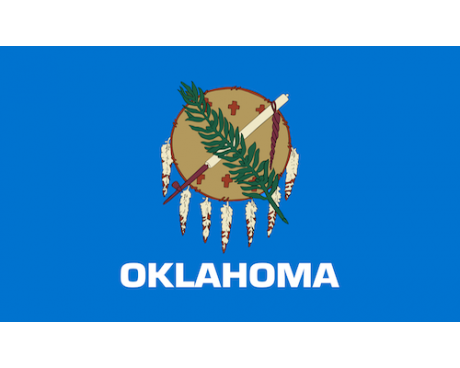 The flag was changed to include the state's name in 1941 as part of the state's efforts to reduce illiteracy in Oklahoma. The flag's colors and dimensions were standardized in 2006 in an effort to reduce the number of unauthorized variants of the flag that were in widespread use. The law served only to clarify the design rather than to change it, and no laws have been passed to change the flag since that time. In the state flag the symbols are featured prominently, and the name of the state derives from an Indian word meaning "red people". 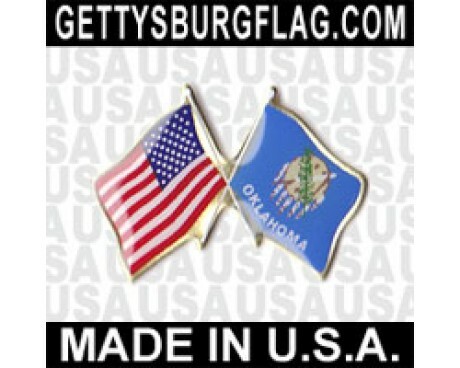 The design of the flag was created by Mrs. Luise Fluke with the help from Dr. Joseph Thoburn of the Oklahoma Historical Society. On the Osage shield an olive branch, and a peace pipe cross. On April 2, 1925 the flag was adopted, and the name of the state was added in May 1941. Oklahoma was originally part of the Louisiana Purchase, and one of the Great Plains states. For many years it was left unorganized as Indian Territory. It became a regular Territory in 1890 after opening up to the white settlers. 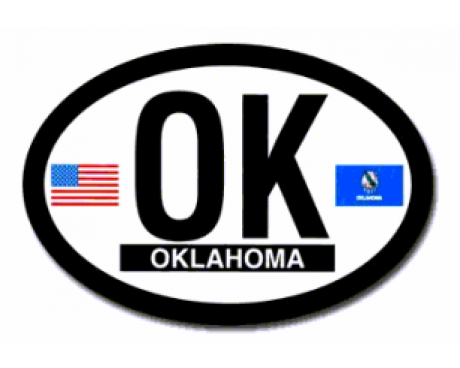 Oklahoma was admitted as a state on November 16, 1907.